Average insurance rates for a 2008 Toyota Corolla are $1,132 a year with full coverage. Comprehensive insurance costs around $194, collision costs $306, and liability costs $474. Buying a liability-only policy costs as little as $522 a year, with high-risk insurance costing $2,444 or more. Teenage drivers receive the highest rates at $4,472 a year or more. Rate data is compiled from all 50 U.S. states and averaged for all 2008 Toyota Corolla models. Rates are based on a 40-year-old male driver, $500 comprehensive and collision deductibles, and a clean driving record. Remaining premium consists of UM/UIM coverage, Medical/PIP, and policy fees. For a middle-aged driver, prices range go from as low as $522 for only liability insurance to the much higher price of $2,444 for a high risk driver. These differences demonstrate why everyone should compare rates for a specific zip code and risk profile, instead of using average rates. Trying to find cheaper insurance for a Toyota Corolla can normally be a lot of work, but you can follow these tips to make it easier. There is a right way and a wrong way to shop for auto insurance and you need to know the absolute fastest way to quote coverages for a Toyota and get the lowest price. Effectively comparing insurance coverage prices can be a lot of work if you aren’t aware of the easiest way. You can waste hours talking about coverages with insurance agencies in your area, or you can utilize online quoting to quickly compare rates. Most of the larger companies participate in a marketplace that enables customers to submit one quote, and each participating company provides a quote based on that information. This eliminates the need for repetitive form submissions for every insurance coverage company. The only downside to pricing coverage this way is that consumers can’t choose which companies to get quotes from. So if you want to choose individual companies to request quotes from, we have a listing of the cheapest insurance coverage companies in your area. Click here to view list. It’s up to you how you get prices quotes, just be sure to compare apples-to-apples coverage limits and deductibles for each comparison quote. 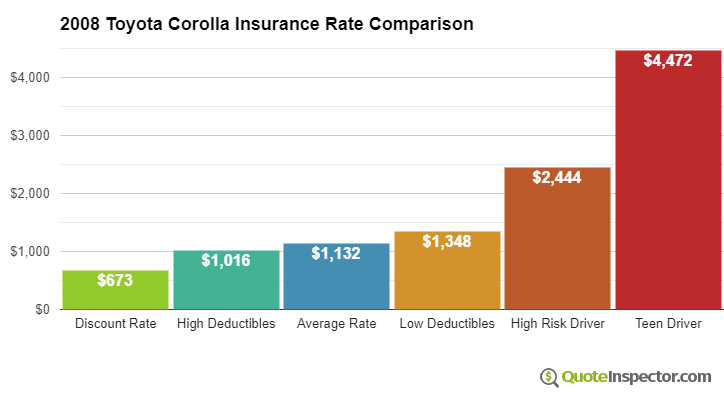 If you have different deductibles you will not be able to determine the lowest rate for your Toyota Corolla. Car insurance is not cheap, but you may find discounts to reduce the price significantly. Certain discounts will be triggered automatically at quote time, but a few need to be asked for before being credited. If you aren’t receiving every discount available, you are paying more than you should be. Good Students Pay Less – A discount for being a good student can earn a discount of 20% or more. The discount lasts well after school through age 25. Seat Belt Usage – Buckling up and requiring all passengers to wear their seat belts could save 15% off the personal injury premium cost. Federal Employees – Active or retired federal employment could cut as much as 10% off on Corolla coverage with certain companies. Multi-car Discount – Having more than one vehicle on one policy qualifies for this discount. Sign Early and Save – Some companies give discounts for buying a policy prior to your current policy expiration. It can save you around 10%. Distant Student – Any of your kids living away from home attending college and do not have a car may qualify for this discount. Military Discounts – Being on active duty in the military could be rewarded with lower premiums. As a disclaimer on discounts, most credits do not apply to the entire policy premium. Most only apply to the price of certain insurance coverages like liability, collision or medical payments. So even though it sounds like it’s possible to get free car insurance, you won’t be that lucky. Any qualifying discounts will cut your premiums. Double check with all companies you are considering which discounts you may be entitled to. Some discounts might not be offered everywhere. When choosing the right insurance coverage, there really is not a best way to insure your cars. Every situation is different. Here are some questions about coverages that may help you determine if your insurance needs would benefit from professional advice. When should I drop full coverage on my 2008 Toyota Corolla? If you can’t answer these questions but one or more may apply to you, you may need to chat with an insurance agent. If you don’t have a local agent, fill out this quick form. It is quick, free and you can get the answers you need. Having a good grasp of your car insurance policy can be of help when determining which coverages you need and proper limits and deductibles. The terms used in a policy can be impossible to understand and even agents have difficulty translating policy wording. This will pay to fix damage to your Corolla resulting from a collision with another vehicle or an object, but not an animal. You will need to pay your deductible and the rest of the damage will be paid by collision coverage. Collision coverage pays for claims like crashing into a building, sustaining damage from a pot hole and sideswiping another vehicle. Paying for collision coverage can be pricey, so consider dropping it from vehicles that are older. Another option is to bump up the deductible to bring the cost down. Comprehensive insurance coverage pays for damage OTHER than collision with another vehicle or object. You first have to pay a deductible and then insurance will cover the rest of the damage. Comprehensive can pay for things such as a tree branch falling on your vehicle, fire damage and damage from a tornado or hurricane. The maximum payout a car insurance company will pay at claim time is the ACV or actual cash value, so if your deductible is as high as the vehicle’s value consider dropping full coverage. Your UM/UIM coverage provides protection from other motorists when they are uninsured or don’t have enough coverage. Covered losses include injuries to you and your family and damage to your 2008 Toyota Corolla. Since many drivers carry very low liability coverage limits, it doesn’t take a major accident to exceed their coverage limits. That’s why carrying high Uninsured/Underinsured Motorist coverage is important protection for you and your family. Most of the time these limits are similar to your liability insurance amounts. This coverage can cover damages or injuries you inflict on people or other property by causing an accident. Split limit liability has three limits of coverage: bodily injury per person, bodily injury per accident and property damage. Your policy might show values of 100/300/100 which stand for $100,000 in coverage for each person’s injuries, a per accident bodily injury limit of $300,000, and $100,000 of coverage for damaged property. Some companies may use a combined limit which limits claims to one amount rather than limiting it on a per person basis. Liability coverage pays for things such as funeral expenses, repair costs for stationary objects and repair bills for other people’s vehicles. How much liability coverage do you need? That is a decision to put some thought into, but you should buy as high a limit as you can afford.